We used data from social media platforms (Google PageRanks, Alexa Ranks, Facebook Likes, Twitter Followers, and Google+ Followers) for EMCC blogs and podcasts to derive three normalized (ordinal, logarithmic, and raw) formulas. The most statistically robust formula was assessed for 1) temporal stability using repeated measures and website age, and 2) correlation with impact by applying it to EMCC journals and measuring the correlation with known journal impact metrics. The logarithmic version of the SMi containing four metrics was the most statistically robust. It correlated significantly with website age (Spearman r=0.372; p<0.001) and repeated measures through seven months (r=0.929; p<0.001). When applied to EMCC journals, it correlated significantly with all impact metrics except number of articles published. The strongest correlations were seen with the Immediacy Index (r=0.609; p<0.001) and Article Influence Score (r=0.608; p<0.001). The SMi’s temporal stability and correlation with journal impact factors suggests that it may be a stable indicator of impact for medical education websites. Further study is needed to determine whether impact correlates with quality and how learners and educators can best utilize this tool. The number of educational blogs and podcasts in emergency medicine and critical care (EMCC) has increased dramatically in the past decade,1 paralleling the growth of digital scholarship in other areas of science.2,3 This proliferation has led to difficulty finding high quality resources2,4 and assessing their scholarly value.3,5 If these problems are not addressed, early adopters could err due to the consumption of poor quality information, and educators could stop contributing due to a lack of recognition. Impact and quality assessment tools for these resources would help address both potential problems. Unfortunately, minimal research has been done to date on how to critically appraise the quality of secondary resources in medical education. Blogs and podcasts could be viewed as the 21st century equivalent of textbooks and lectures,6 but these historic parallels provide little guidance on quality assessment. Continuing medical education lectures do not typically undergo full peer review before presentation and printed textbooks have variable review processes. Solutions such as incorporating formal peer review processes into blogs and podcasts have been pioneered7 but have not been widely adopted. New metrics are needed to assess the impact of blogs and podcasts in a similar way that impact factors assess journals. The journal impact factor (JIF) and Eigenfactor™ metrics were developed to illustrate the scientific importance of traditionally published academic literature.8-11 While never devised to be a marker of quality, “the use of the impact factor as a measure of quality is widespread because it fits well with the opinion we have in each field of the best journals in our specialty.”11,12 Despite arguments that impact factors are a poor surrogate for quality, they are used for university rankings and inform the hiring, funding, and promotion/tenure decisions that affect scholars.11,13 Regardless, the indices that are used for traditional journals cannot be applied to websites. Alternative metrics (“altmetrics”) that assess online engagement through a broad range of measures have been found to correlate with the citations of journal articles,14 and are increasingly being recognized by institutions and granting organizations.3 Altmetrics from social media sources such as Twitter, Facebook, Google+, LinkedIn, and Reddit have been found to “crowd-source” impact assessment by combining individual endorsements.15 External composite rankings of website importance, popularity, and impact, such as Alexa Rank16 and Google PageRank,17 are metrics that use proprietary methods that incorporate website traffic and inbound/outbound links. Impact Story is a new, web-based tool that helps to quantify the impact of individual blog posts, datasets, and research articles for individual authors.18,19 While these novel metrics are potentially useful for assessing the impact of an individual blog post or podcast, they are unable to identify high-impact blogs and podcasts for learners and educators. In this paper we propose and define the Social Media index (SMi), a new metric that combines various altmetrics to measure the impact of websites as a whole. It differs from the metrics previously described in that it combines social media followership with composite website rankings into a score for a website rather than an article, blog post, or journal. It was derived using open-access EMCC podcasts and blogs because of the large number of these resources available.1 In addition, we assessed the ability of the SMi to measure impact by calculating the SMi scores for EMCC journals and assessing their correlation with known journal impact metrics. We obtained a list of 245 EMCC websites using a previously described methodology.1 A prospective, snowball sampling technique was used prospectively on an annual basis between 2002 and 2013 to compile a database of blog and podcast websites that were linked to each other. Additional websites were identified through personal communications, social media accounts, and a self-report form on the Life in the Fast Lane (http://lifeinthefastlane.com) website. We conducted a retrospective keyword search using Google in November 2013 using the terms: (“emergency medicine” OR “critical care” OR “intensive care”) AND (podcast OR blog) to identify any websites missed using the other processes. All websites found were reviewed and included in the study if they hosted freely accessible blogs or podcasts related to EMCC, were written in English, were active within the previous six months, and were not hosted on an institution’s or medical journal’s website. Journal inclusion criteria were decided a priori to provide a broad range of literature of relevance to EMCC physicians. As categorized by the 2012 Journal Citation Report Journal Impact Factor,22 the top five “medicine, general & internal” journals (in order: New England Journal of Medicine, Journal of the American Medical Association, Lancet, British Medical Journal, and PLOS Med) and all “emergency medicine” and “critical care” journals composed in English were considered for inclusion. Journals with Facebook and Twitter accounts were included in the analysis. 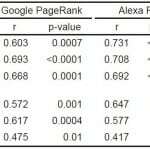 The five variables described in Table 1 (Alexa Rank, Google PageRank, Twitter Followers, Facebook Likes, and Google+ Followers) were assessed to be components of the SMi. We considered these variables because they were publicly available metrics used by many EMCC websites. Personal or website accounts (whichever was greater) were eligible for Twitter Followers and Google+ Followers because a large number of websites are promoted on these platforms exclusively using openly accessible personal accounts. Only the Facebook pages of websites (rather than individuals) were eligible for inclusion because personal accounts are considered private. Table 1. Definitions of the variables considered for the Social Media index. b A medical organization listed as an official sponsor on the About page of the Journal. c An author or editor listed on the Author or About page of the website. We gathered data on all five metrics from the included EMCC websites for four consecutive weeks between December 29, 2013 and January 19, 2014 and again on July 27, 2014. The final collection point was initially planned for six months; however, the authors were unavailable to collect data until nearly seven months. On each date, data for all websites were collected within a single 12-hour period by one of two authors (QP, JS) and audited by a third (BT). Data were gathered on the EMCC journals on January 20, 2014, within 24 hours of the website data collection on January 19, 2014. We initially calculated the SMi using raw data. However, due to high skewness, modified versions were calculated using logarithmically transformed data and ordinal data. In all formulas each of the five metrics was given equal weight by normalizing the individual values relative to the highest value. We then added the scores for each component to calculate the SMi. The rankings of the SMi and each of its components were calculated separately for EMCC website and journals. This allowed the relative rank and impact of each website and journal to be assessed in their respective category. We calculcated descriptive statistics for the website SMi and each of its components. We determined its temporal stability by correlating its values at one time point with its values one week, two weeks, three weeks, and seven months later. We also determined the correlation between the SMi on December 29, 2013, and the age of each website. We measured the correlation between traditional journal impact metrics (Journal impact factor, Five-year journal impact factor, Immediacy index, Cited half-life, Eigenfactor, and Article influence score), the journal SMi score, and the components of the journal SMi (Google PageRank, Alexa Rank, Twitter Followers, and Facebook Likes). Spearman rank correlations were used for the analysis due to the non-linear monotonic associations present in the data. We used a two-sided alpha of 0.05 to determine statistical significance. One hundred sixty-three of 245 (66.5%) of the websites and 29 of 44 (65.9%) of the journals met the outlined inclusion criteria. The mean (SD) and median (IQR) age of EMCC websites was 2.9 (1.9) years and 2.0 (2.0) years with the oldest being 12 years old. We assessed five selected variables for inclusion in the SMi, but Google+ was excluded because few (6.7%) of the websites had substantive accounts (>100 followers). Substantive accounts were available for a much greater proportion of websites on Alexa (95.7% ranked), PageRank (76.7% rated >0), Twitter (71.8% had >100 followers) and Facebook (25.2% had >100 likes). 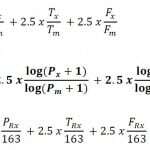 The formulas that we considered are listed below where A=Alexa; P=PageRank; T=Twitter; F=Facebook; x=blog, podcast, or journal; m=maximum value; Rx= rank of x (Figure). The four components were given equal weight by normalizing the values on a scale of 0 to 2.5 to produce a total website SMi or journal SMi with a minimum score of 0 and maximum score of 10. Figure. Formulas used for Social Media index (SMi) calculation. Although the logarithmic and ordinal versions of the SMi were highly correlated (Spearman r>0.95), the logarithmic version of the SMi (logSMi) was judged to have the best operational characteristics because it was the most normally distributed and least subject to skewness of the individual components. Therefore, it was selected as the definitive SMi formula for further evaluation and henceforth will be referred to as the SMi. 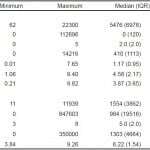 December 29, 2013 to January 5, 2014, r=0.991, p-value<0.001; December 29, 2013 to January 12, 2014, r=0.796, p-value<0.001; December 29, 2013 to January 19, 2014, r=0.806, p-value<0.001; December 29, 2013 to July 27, 2014, r=0.929, p-value<0.001. The SMi demonstrated a wide range with normal distribution. For websites the mean (SD) was 4.52 (1.65), with a range from 1.06 to 9.40. When applied to the included journals the SMi had a mean (SD) of 6.27 (1.30) with a range from 3.84 to 9.26. 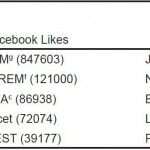 Social media followership for websites and journals varied widely across each component of the SMi (Table 2). 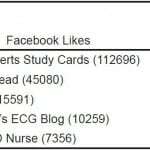 ECG Experts Study Cards (112,696 Facebook followers) and Life in the Fast Lane (14,216 Twitter followers) had high social medial followership for websites while the New England Journal of Medicine (847,603 Facebook followers) and JAMA (350,000 Twitter followers) had high social media followership for journals. Table 2. Summary statistics for the Social Media index and their individual components (163 websites and 29 journals). Ranked in their own media categories by SMi (Table 3a and 3b), the top three websites were Life in the Fast Lane (9.40), Academic Life in Emergency Medicine (8.89), and EMCrit (8.68). The top three journals (Table 3) were New England Journal of Medicine (9.26), British Medical Journal (9.09), and JAMA (8.75). The large increase in SMi, by approximately one standard deviation, between American Journal of Critical Care and Lancet illustrates the jump from specialty-specific EMCC journals to general medical journals. The highest ranked emergency medicine-specific journals were Annals of Emergency Medicine (6.61), Emergency Medicine Journal (6.22), and Academic Emergency Medicine (5.96). Table 3a. The top five websites as calculated and by the Social Media index and its components. The numbers in parentheses indicate the raw value for each website or journal. PageRank values excluded from the table due to ties (only integer values from 0 to 10 are available). a ALiEM, Academic Life in Emergency Medicine. b LITFL, Life in the Fast Lane. c SMi, logarithmic formula for the Social Media index. Table 3b. The top five journals as calculated by the Social Media index and its components. Traditional journal impact metrics correlated significantly with journal SMi score (Table 4). The strongest correlations were seen between the journal SMi score and Immediacy Index (r=0.609, p-value=<0.001) and Article Influence Score (r=0.608, p-value<0.001). Five-year Journal Impact Factor (r=0.526, p-value=0.001), Journal Impact Factor (r=0.526, p-value=0.003), and the Eigenfactor score (r=0.425, p-value=0.02) correlated less strongly. When assessed alone, each of the journal SMi components also correlated with traditional journal impact metrics (Table 4). This was particularly true for Alexa Rank and Google PageRank, which correlated more strongly than the journal SMi in several cases. The SMi has several characteristics that make it a viable measurement of impact for learners, educators, and administrators. First, learners, educators, and administrators can apply these publically available metrics and transparent SMi formula without permission or cost. Second, our assessments of the SMi’s temporal attributes suggest that it measures long-term impact, rather than spikes in popularity. Furthermore, it is not unduly influenced by longevity, suggesting it is possible for new resources to be recognized. Because no gold standard exists to measure social media educational resource impact, we examined how the SMi formula for journal websites would perform in comparison to traditionally recognized journal impact metrics. Our data found that a journals’ online followership, as quantified by the SMi formula, correlates with these metrics. Its particularly strong correlation with the Immediacy Index25 and Article Influence Score9,10 suggests that in journals it is most predictive of fast citations and influential articles. Further optimization of the SMi by weighting its components based on their correlation with journal impact was not performed because (1) no single gold standard exists for journal impact and (2) the impact of educational websites and journals may not correlate perfectly with the impact of journals. Two of the four components of the SMi, Alexa Rank and Google PageRank, focus on website traffic and inbound links.16,17 As higher-impact journals are likely to have higher traffic webpages and a greater number of inbound links, it follows that these two web rankings correlated strongly with traditional measures of journal impact presumably because they publish articles that are discussed and read more frequently. However, to our knowledge this finding has not previously been reported in the literature. It may be of interest to journal publishers who would like to track their impact more closely. The other two components of the SMi, Twitter Followers and Facebook Likes, also correlated with traditional journal impact factors. This is unsurprising as the altmetrics of individual articles have been shown to correlate with future citations,15 and journals with higher social media followership would be more likely to have their content shared. However, the correlations for Twitter Followers and Facebook Likes with journal impact factors were not as high as Alexa Rank and Google PageRank. Despite this, we believe Twitter Followers and Facebook Likes are important indicators to include within the SMi because they are likely better measures of followership, whereas Alexa and Google PageRank focus slightly more on viewership.26 We hypothesize that followership is an indirect measure of source credibility and thus an important measure of impact for these resources. While it is not a perfect parallel, following the social media accounts of a blog or podcast mirrors subscribing to a journal and is a significantly greater commitment than reading a single post, listening to a single podcast, or downloading a single journal article. 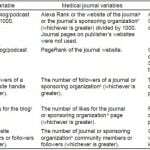 For this reason we believe that the followership of social media channels, despite not correlating quite as well with journal impact, provides a different but important perspective on the impact of blogs or podcasts that would be lost were one of the other two metrics (Alexa or Google PageRank) considered alone. To further the research agenda on the assessment of social media educational resources, our research group is in the process of deriving a quality assessment tool for blogs and podcasts using education literature and data from modified Delphi surveys of stakeholders. Future studies will assess the validity of this quality assessment tool and its correlation with the SMi. Our hypothesis that followership is a surrogate marker of quality will continue to be tested and modified with this research. Moving forward, we are designing a program that will gather the required data, calculate the SMi, and update a webpage on a weekly basis. The results will be openly accessible on the website http://aliem.com/social-media-index. Additionally, as online resources are developed outside of EMCC we anticipate calculating rankings for medical education blogs and podcasts in other health professions. There are many other social media platforms used by blogs and podcasts that were excluded from the SMi. Not taking these platforms into account may underscore websites that use platforms such as Google+, YouTube, and iTunes to distribute their content. However, due to the small number of websites using these platforms (Google+ and YouTube) and lack of publicly available metrics (iTunes) they were excluded from the current iteration of the SMi. As social media continues to evolve, the SMi may be modified to accommodate trends in its use. In this study the SMi was derived using a subpopulation of medical education websites (blogs and podcasts) focused on a relatively specific field (EMCC). This was done intentionally to provide a homogenous group of websites for derivation of the SMi. However, its generalizability would be strengthened if it were applied successfully to other online educational products from various fields of medicine. Follow-up studies using the methodology outlined in this study and websites/journals from other specialties could provide further validity evidence for the SMi. The selection of time intervals to assess the temporal stability of the SMi was somewhat arbitrary. We intended to demonstrate short-term stability with the weekly intervals and medium-term stability with follow-up approximately six months later; however, other time intervals could have been selected. We cannot speculate as to how this would have affected our results. While the collection of our final data point was slightly delayed, the strong week-to-week correlation at the beginning of the study suggests it would have been unlikely to change our results. The number of educational websites continues to grow, especially in the field of EMCC. The SMi has the potential to be a stable and accessible indicator of their impact. If the results of this study can be replicated it would benefit medical professionals by identifying resources for learners and assessing scholarly impact of educators that are using these media. Regardless of whether the SMi becomes the gold standard for the assessment of impact for online medical education resources, it should contribute to the discussion towards the development and validation of impact and quality metrics. Conflicts of Interest: By the WestJEM article submission agreement, all authors are required to disclose all affiliations, funding sources and financial or management relationships that could be perceived as potential sources of bias. Dr. Brent Thoma is the Editor of the BoringEM website, an Associate Editor at the Academic Life in EM website, and a Social Media Editor for the Canadian Journal of Emergency Medicine. Dr. Michelle Lin is the Editor-in-Chief of the Academic Life in Emergency Medicine website. Dr. Teresa M. Chan is the Editor of the BoringEM website, an Associate Editor at the Academic Life in EM website, and a Social Media Editor for the Canadian Journal of Emergency Medicine. None of the authors receive financial compensation in these roles. 1. 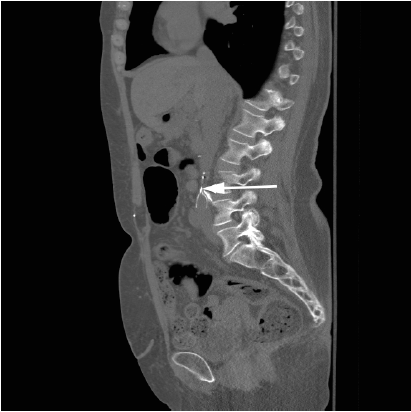 Cadogan M, Thoma B, Chan TM, et al. Free Open Access Meducation (FOAM): the rise of emergency medicine and critical care blogs and podcasts (2002–2013). Emerg Med J. 2014;31(e1):e76-7. 2. Brabazon T. The Google Effect: Googling, Blogging, Wikis and the Flattening of Expertise. Libri. 2006;56(3):157-167. 3. Piwowar H. Value all research products. Nature. 2013;493(10):159. 4. Kritz M, Gschwandtner M, Stefanov V. Utilization and perceived problems of online medical resources and search tools among different groups of European physicians. J Med Internet Res. 2013;15(6):e122. 5. Cheverie JF, Boettcher J, Buschman J. Digital Scholarship in the University Tenure and Promotion Process: A Report on the Sixth Scholarly Communication Symposium at Georgetown University Library. J Sch Publ. 2009;40(3):219-230. 6. Thoma B, Chan T, Benitez J, et al. Educational Scholarship in the Digital Age: A Scoping Review and Analysis of Scholarly Products. The Winnower. 2014;1:e141827.77297. 7. Thoma B, Chan TM, Desouza N, et al. Implementing Peer Review at an Emergency Medicine Blog: Bridging the Gap between Educators and Clinical Experts. Can J Emerg Med. 2014;0:1-4. 8. Garfield E. The history and meaning of the journal impact factor. J Am Med Assoc. 2006;295(1):90-93. 9. West JD, Bergstrom TC, Carl T. The eigenfactor metrics TM : a network approach to assessing scholarly journals. Coll Res Libr. 2010:236-244. 10. Rizkallah J, Sin DD. Integrative approach to quality assessment of medical journals using impact factor, eigenfactor, and article influence scores. PLoS One. 2010;5(4):e10204. 11. Carpenter CR, Cone DC, Sarli CC. Using publication metrics to highlight academic productivity and research impact. Acad Emerg Med. 2014;21(10):1160-1172. 12. Hoeffel C. Journal impact factors. Allergy. 1998;53:1225. 13. Monastersky R. The number that’s devouring science. Chron High Educ. 2005. 14. Priem J. Beyond the paper. Nature. 2013;495:437-440. 15. Thelwall M, Haustein S, Larivière V, et al. Do altmetrics work? Twitter and ten other social web services. PLoS One. 2013;8(5):e64841. 16. Alexa: The Web Information Company. Alexa. Available at: http://www.alexa.com/. 17. Franceschet M. PageRank : Standing on the shoulders of giants. Commun ACM. 2011;54(6):92-101. 18. Priem J, Piwowar H. Impact Story. Impact Story. 2013. Avaiable at: http://impactstory.org/about. 19. ImpactStory. Wikipedia. Available at: http://en.wikipedia.org/wiki/ImpactStory. 20. Thoma B. BoringEM. Available at: http://boringem.org. 21. Lin M. Academic Life in Emergency Medicine. Available at: http://aliem.com. 22. 2012 Journal Citation Reports® Science Edition. 2012. 23. Purdy E, Thoma B, Bednarczyk J, et al. The use of free online educational resources by Canadian emergency medicine residents and program directors. Can J Emerg Med. 2014. 24. Mallin M, Schlein S, Doctor S, et al. A survey of the current utilization of asynchronous education among emergency medicine residents in the United States. Acad Med. 2014;89(4):598-601. 25. Amin M, Mabe MA. Impact factors: use and abuse. Perspect Publ. 2000;63(4):347-354. 26. Thoma B. Social Media Index: Controversy and Evolution. Acad Life Emerg Med. 2013. Avaiable at: http://aliem.com/social-media-index-controversy-and-evolution/. 27. Priem J, Hemminger BM. Scientometrics 2.0: Toward new measures of scholarly impact on the social web. First Monday. 2010;15(7). 28. Rossner M, Van Epps H, Hill E. Show me the data. J Gen Physiol. 2007;1(2). 29. Arnold DN, Fowler KK. Nefarious Numbers. Not AMS. 2011;58(3):434-437. 30. Anderson J. Chrome SEO Status Toolbar. 2013. Avaiable at: http://www.rubyweb.org/seo-status-toolbar/google-chrome-seo-status/.